Alexa Westley of Warren Hills, Chris Romero of Voorhees, and the North Hunterdon and Pope John boys ruled the day by shredding the newly designed layout at Greystone on Saturday at the Stewart Memorial Invitational in Morris Plains. Westley and Romero threw down the fastest time run so far on the new Greystone course, which is just a few weeks old. Westley, a junior who won the 3,200 at the Meet of Champions last spring, cranked out an 18:02 to win the girls A Division race by 150 yards. In the boys B race, Romero hit the mile in 4:42 and two miles in 9:43 on his way to a sizzling win in 15:32,18 seconds in front of runner-up Fahd Nasser of McNair (15:50). The other two individuals winners were Ray Sellaro, who ran 15:53 to lead NJ #5 North Hunterdon to the boys A Division team title, and Morgan Mehmel, whose 19:03 led a 1-2-3 finish for B Division team winner Villa Walsh. North Hunterdon had the top boys team performance of the day as the the Lions averaged 16:23, defeated Morris Hills, 50-84 in the A race, and won the team merge, 79-126 over Morris Hills. Morris Hills had a great race with a 1-5 compression of 13 seconds, PR's from its 2-7 runners, and an average of 16:42. 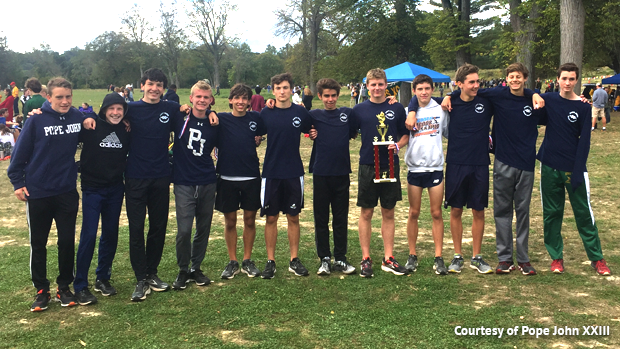 In the boys B race, Pope John averaged 16:39 and picked up 5 PR's on the way to a huge win over two defending state champs. PJ edged NJ #6 and 2016 Group 2 champ Voorhees, 50-55, and 2016 Group 1 winner Metuchen was third with 66. Pope John, which went 3-4-12-13-19, was led by Jimmy Zignorski, third in 16:04. On the girls side, Watchung Hills averaged 20:33 and edged Bridgewater Raritan, 53-56 for the A Division title when its No. 5 runner beat Bridgewater's No. 5 by 11 spots. In the B race, Villa Walsh averaged 20:05 and rode its 1-2-3 finish to edge Bernards, 48-51, but Bernards did come out on top in the team merge, 87-96 over Villa Walsh. With the NJAC, Morris County, N.J. Sec. 2 and NJCTC Championships all being held at Greystone later this season, it will be interesting to see how much if any the course records run today by Westley and Romero come down, and what the conversion times from Greystone to other courses will look like. And with the championship portion of the season just a couple weeks away, it's time to start thinking about how fast the Hunterdon-Warren-Sussex and Skyland Conference races will be when Romero, Sellaro and Justin Cornetta of Hunterdon Central square off!!!! Course records will be on shaky ground for sure! !